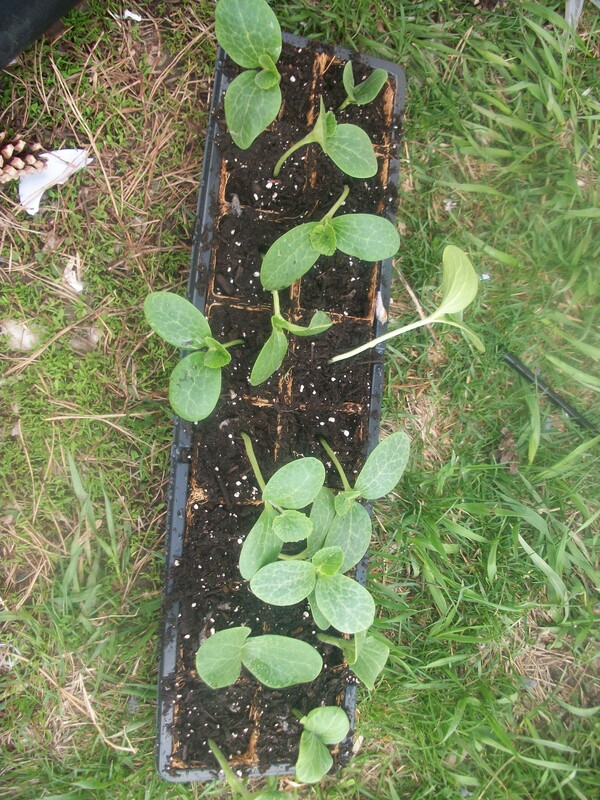 Part of our new garden project will include Spaghetti Squash for George to eat through the winter. Our garden is taking on a new role this year. You see, with George not being able to consume much for protein, that really, really, really limits his diet. So I decided that instead of spending a ton of money on frozen and canned fruits and veggies, that I would try to supplement his diet with our own home-grown veggies. Spaghetti squash will replace his noodles, I’ve started some sugar snap peas, some watermelon and I will get a few packs of other veggies and fun stuff at the greenhouse this week. I can’t wait! I started these seeds inside a few weeks ago, but they’re outgrowing my containers and the garden isn’t ready yet for them to go outside. So I transplanted them this weekend. I'm new to all this, so these are my chosen tools for the year. 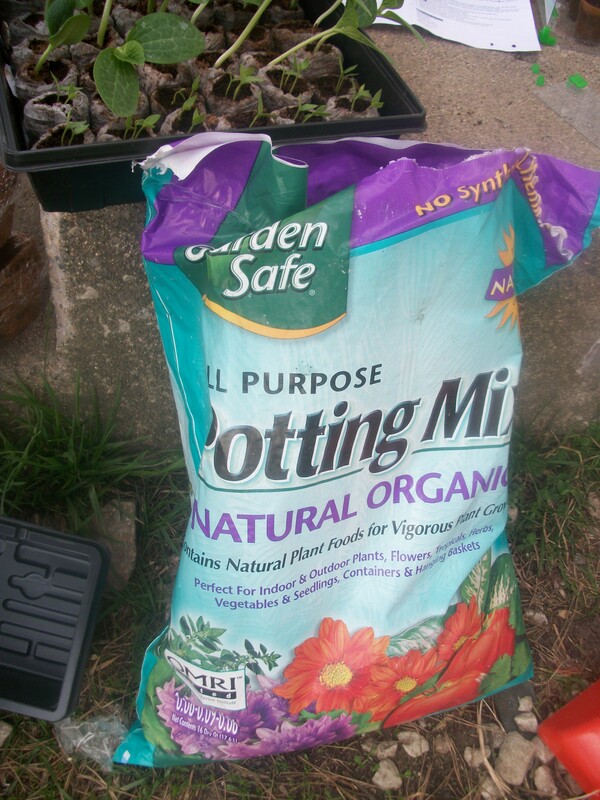 I, of course, needed some extra soil. 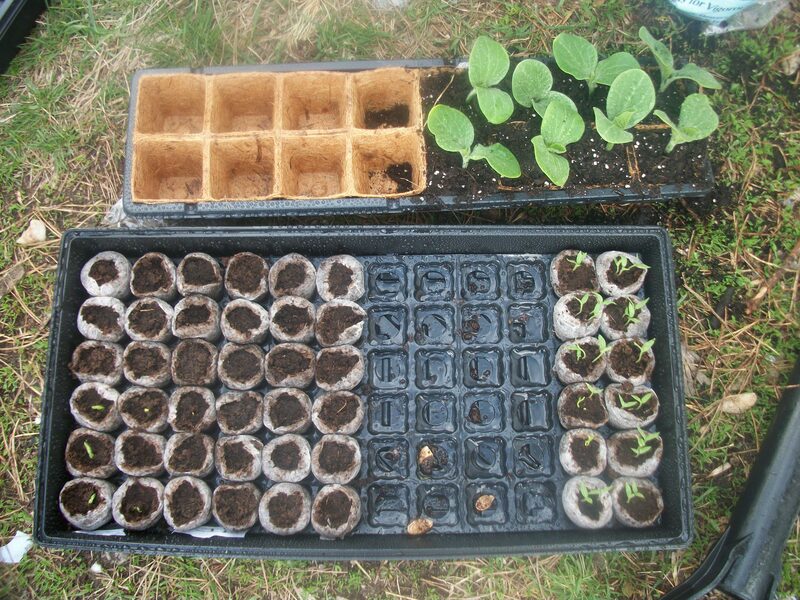 The bottom is what I started with, and the finished product transplanted at top! 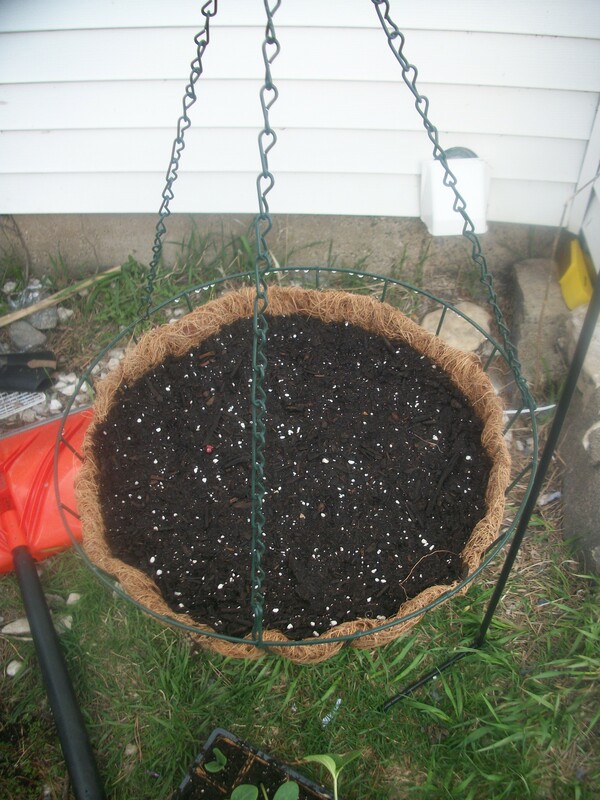 I even planted a few flowers in a hanging basket. I know, it's scary for me too! OK, so in the last week or so, I’ve baked, I’ve crafted and now I’m gardening. I think Mark’s going to be glad I started this whole blogging thing! 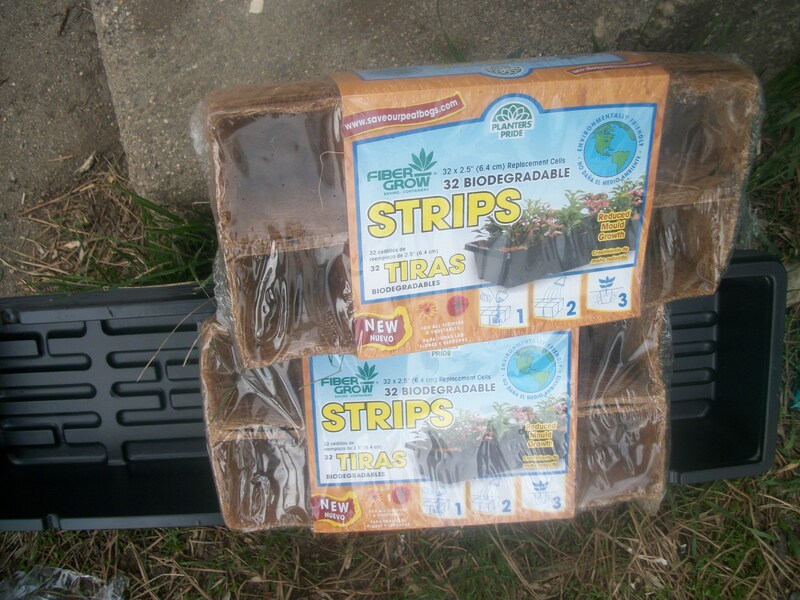 This entry was posted in Farm life, Food freedom, gardening and tagged farm life, food choices, gardening, life on the farm, why blog by wagfarms. Bookmark the permalink. Good luck on your garden, and keeping George well fed with all your produce! Hi Val, thank you for your comment on my blog today! Being farmers today must be so hard. My best girlfriend in Germany lives on a pig farm, and we love visiting her and her family. I grew up spending summers on a farm and those are my best memories. Is it correct that Monsanto pushes their seeds on farmers? I would love to learn so much more about the farmer’s POV in the GMO debate. Thanks for writing! I can’t wait to learn more from you, as well. Sometimes life on the farm doesn’t give me as much of a “worldly” view as I would like, but thanks to social media (and blogs like yours! ), I’m able to learn so much more about other communities! I’m just thankful to be able to raise our boys in this environment, and couldn’t imagine living anywhere else! As far as Monsanto goes, I can tell you that we’ve never had any seed “pushed” on us…ever. We look at our fields, we look at our soil records (we have samples taken every year, to ensure that our soil isn’t over-fertilized, stressed, etc. ), and we take into account the advice from our crop consultant (he’s the guy that understand what all the records mean! 😉 ) before we decide what to plant where. We have neighbors that sell seed, as well as a local elevator, and we decide what seed to plant based on our history with certain seed types, crop research that has been done, and costs involved. Now, that’s not to say that seed salesmen don’t come into the yard and give their talks and try to show that their seeds are better than others, etc., but that happens in every industry. It’s how salesmen make their living. From this farmer’s standpoint, (and more importantly…a mother) I see a world where we have fewer and fewer acres that are available to grow crops on. Those are the crops that will feed a world population. We may not like the “idea” behind big farms, but the fact of the matter is that we need to have EVERY farm. Big, small, in between…as long as there are people needing to eat, we need to have farms. They are all part of the equation. I have no problems with GMO’s personally. As a farmer, I see the benefits every year. But on the other hand, I respect those that choose not to purchase certain products. That’s the choice that a consumer gets to make at the store, every day. But we still need to have viable food options for every family…not just those that can afford it. I’d love to learn more about some of the things that you’ve read or heard, and maybe show you a bit of what happens on OUR farm. I know it’s not the same everywhere, but I know a lot of farmers, just like us.